The Regina Pats (8-19-0-0) wrap up a stretch of three games in three days on Sunday afternoon when they host the Medicine Hat Tigers (12-13-1-2). Puck drop is at 4:00 p.m. at the Brandt Centre. The Pats are coming off a 5-2 loss on home ice on Friday to the Prince Albert Raiders. The Tigers hosted the Lethbridge Hurricanes on Friday and fell 3-1, which snapped a two-game win streak. 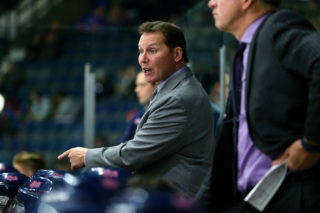 Tonight is the second of four meetings between Regina and Medicine Hat, the Pats are 0-1-0-0 so far in the season series. Tonight’s game can be heard with Bennett Dunlop Ford Pats Hockey starting at 3:35 p.m. on 620 CKRM. 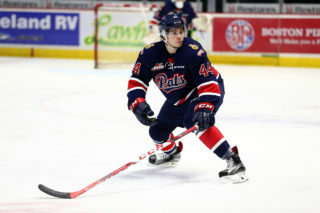 The Regina Pats battled hard in a 5-2 loss on home ice to the Prince Albert Raiders on Saturday night. Regina opened the scoring when Carter Massier finished off a three-on-one rush for his first career WHL goal to make it 1-0. Prince Albert got it back with 27 seconds left in the first on the powerplay and it was 1-1 at the break. The Pats outshot Prince Albert 12-10 in the second but gave up the lone two goals, one even strength and one on the powerplay and trailed 3-1 after 40 minutes. In the third, Jadon Joseph scored a beauty powerplay goal from the right circle to get the Pats within one with seven minutes left. However, the Raiders got two in the final minutes to win their 19th straight game, 5-2 the final score. The Pats were outshot 29-26, the powerplay was one for four, the penalty kill two for three and Dean McNabb made 24 saves in the defeat. 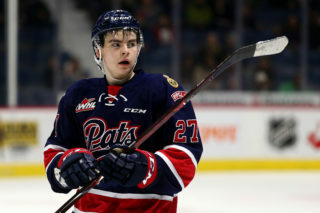 Pats rookie forward Carter Massier scored his first career Western Hockey League goal on Saturday night against the Prince Albert Raiders. 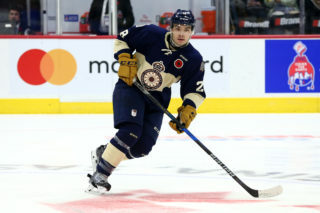 The 17-year-old stole a puck at his own blue-line and led a three-on-one into the offensive zone. He passed off and then got the puck back and buried a shot over the left pad of Ian Scott for his first in the league. Massier, a product of Peace River, Alberta has played in 20 games so far this year, picking up a goal and an assist. He was listed and signed by the Pats during the 2017-18 season. 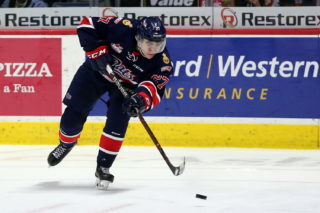 Newly acquired centerman Jadon Joseph scored his first goal in a Pats uniform on Saturday night in the third period. The 19-year-old put a seeing-eye shot off the post and in from the right circle to draw Regina to within a goal with seven minutes left to play. Joseph has a goal and an assist in his first two games since the Pats got him in a trade with the Lethbridge Hurricanes. The native of Sherwood Park, Alberta is up to 21 points in 25 games, 11 of those goals. Both of Joseph’s points with the Pats have come on the man advantage. The Pats penalty kill is enjoying one of its best stretches of the season, going 80 per cent in the last five games. Regina has given up just six goals on 30 opportunities in that stretch to climb above the 70 per cent mark on the penalty kill for the season. The Pats currently sit at 70.6 per cent after 27 games, that is 21st in the WHL, ahead of the Brandon Wheat Kings who are at 67 per cent. The Pats have scored three shorthanded goals this year, Sergei Alkhimov, Scott Mahovlich and Nick Henry all picked up goals while down a man.